One of the newest features in location based services is Broadcastr! This application (both available on the internet and on your mobile) makes it possible to offer location based storytelling or location based radio. 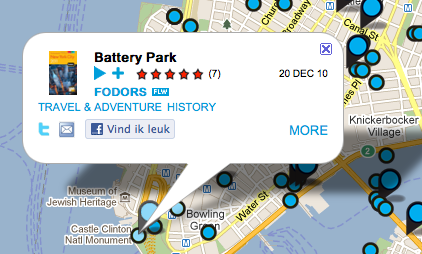 It's simple to use: sign in, upload sounds (stories, music, interviews or whatever) and pin it to the map. You can even share your stories on Facebook. Great option on your mobile app: Geoplay. Switch it on and it automatically lets you hear the stories as you walk past the locations. Broadcastr is another great technological option you can use in your destination marketing! Use it for your museum, your restaurant, your shop. And of course it is a great tool to market your city or destination by posting a range of stories (f.e. historical city walks). Only drawback at the moment is the roaming costs which make it very expensive to use for foreign visitors. At this moment in time you will need a wifi network abroad to keep the costs down.